At least 22 people were killed and scores more seriously burnt after an illegal oil well ignited in the early hours of Wednesday (April 25) morning in the eastern Aceh Province village of Pasi Putih, on the island of Sumatra, Indonesia. Local authorities report that the newly drilled well — said to have been sunk to a depth of 250 metres (about 820ft) — was gushing oil when it ignited at about 1.30am local time. 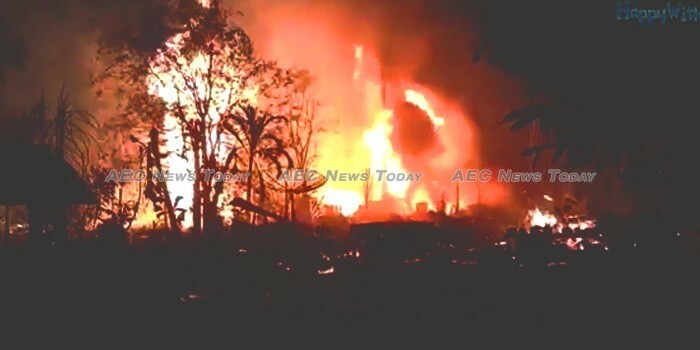 According to National Disaster Mitigation Agency spokesman Sutopo Purwo Nugroho at least eight houses close to the well were incinerated, while local emergency service personnel reported more than 40 people having been transported to hospital with second and third degree burns covering up to 60 per cent of their bodies. According to a report filed by the Associated Press (AP) the well had been operating for at least the last several days, with police spokesman quoted in one report as saying “there were many people there who were smoking” as they foraged for oil around the well head. Earlier this month five fishermen were burnt to death when oil leaked from an undersea pipeline, sending a giant oil slick along the coast of Balikpapan, on the island of Borneo. State-owned oil company Pertamina at first denied that it was the cause of the leak, before finally admitting it was at fault. Last week the Indonesia government fired Elia Massa Manik, president director of Pertamina, and four other directors over the incident, as well as over other non-performance issues. Indonesian authorities increased the number of people confirmed killed from the the initial 15 to 22. This story has been updated to reflect that.